Christ Episcopal Church will open two new artists’ exhibits in the Parish House’s Gallery and in the Parlor at the Artists’ Reception, Friday, April 12, from 5:00-8:00 pm. The reception is free and open to the public. These exhibits will be on display and available for purchase through the end of June. James Hayes, the well-known glass artist, will exhibit glass hangings, as well as some of his select paintings, in the Gallery. His exhibit is entitled “Chaos.” Mr. Hayes uses nature, chance, and his experiences as inspiration for his art glass. His art is playful, adventurous, colorful, and distinctive. After learning glassblowing at the Arkansas Arts Center Museum School, he has studied glassblowing around the world, including Italy, France, Istanbul, New York, Seattle, and Hong Kong. Mr. Hayes has had numerous solo and group exhibitions throughout the United States. Local artist Jacqui Whitehead’s “Mystical Menagerie” exhibit will be showcased in the Parlor. As an intuitive artist, Ms. Whitehead says her paintings reflect her soul. Her love of people and nature allow colorful, happy, and whimsical creatures of every sort to become her subjects. Having taught fourth grade in the North Little Rock School District for 25 years, she credits her arts in education classes for instilling the importance of the arts in childhood development. Christ Church believes that artists, whether painters or singers or sculptors or poets, show something of God when they show us the world’s truth and beauty through their talents. A rotating display of original artwork by local artists almost always hangs on the walls of the main gathering space in the Parish House. The Gallery is open to the public each weekday during regular business hours. The Gallery is also a regular stop on downtown Little Rock’s Second Friday Art Night. This new exhibition kicks off with a reception on Second Friday that is free to the public, with the featured artists present. The Central Arkansas Chapter of the American Guild of Organists presents The Sixteenth Annual Concert Celebrating the Life of Robert Young Ellis. Featuring Henry Webb, organist, it will take place tonight (April 5) at Christ Episcopal Church. There is no admission cost. Henry Webb is a Sophomore at the Eastman School of Music, studying Organ Performance with Nathan Laube. For the year following his high school graduation, Henry served as Organ Scholar at the Church of the Incarnation in Dallas, Texas under the guidance of Graham Schultz and Scott Dettra. Henry began his music studies in late 2010 and his teachers have included Christina Harmon and Scott Dettra. In 2012, Henry received first prize in the Oklahoma City University High School Organ Competition. He has been featured as a recitalist in Texas and beyond, notably as part of the dedicatory series at the parish of Christ the King, Dallas, the Baylor University’s Pipedreams Live, and the 2016, 2017, and 2018 East Texas Pipe Organ Festival. Henry has participated in numerous organ academies including the Oberlin Organ European Winter Term and Summer Academy, the Leipzig Europäische Orgelakademie, French and Spanish Organ Music Seminars, various Pipe Organ Encounters, and Curtis Institute Organ Camps. Henry also enjoys Astronomy, hiking, photography, and playing tennis. Robert Young Ellis was Professor of Organ at Henderson State University in Arkadelphia for 35 years from 1952 to 1987. It is hoped that this series will inspire musicians young and old, as Ellis, through his teaching and playing, influenced innumerable students and colleagues who remember him as a musician of genius and as one who brought both wit and sophistication to the lesson and to the classroom. Considered by many to be the leading U.S. ensemble in the Anglican choral tradition, the Saint Thomas Choir of Men and Boys provides music for five choral services each week at Saint Thomas Church Fifth Avenue, NY, and for the past three decades has also toured throughout the U.S. and Europe. Tonight (March 21) they will be in concert at Christ Church in downtown Little Rock at 7pm. Director of Music, Daniel Hyde, will make his final tour with the choir in March, of which their concert at Christ Church will be a part. Admission is $25, $10 for students. Ticket are on sale at the door the night of the performance. Richard Webster is a leading American composer of church music, especially of brass arrangements for congregational hymns. Webster will lead the Christ Church Choir and the congregation in “Blow Ye the Trumpet in Zion: A Festival of Hymns for the Church Year,” singing your favorite hymns set to dazzling arrangements for brass. The hymn festival is free and open to the public (so bring a friend! ), and a festive reception will follow. The program starts at 7pm at Christ Church, located at the corner of Scott and Capitol Streets. Tonight at 8pm, Mulehead performs in The Undercroft. Band mates Kevin Kerby, Geoff Curran, David Raymond, and Brent LaBeau are promising a “chill set” for their next concert underneath the church. Are they telling the truth? Come see—and enjoy a “Capitol” night with homemade Undercroft Brew and soda for a donation. The Undercroft is located at 509 Scott Street. 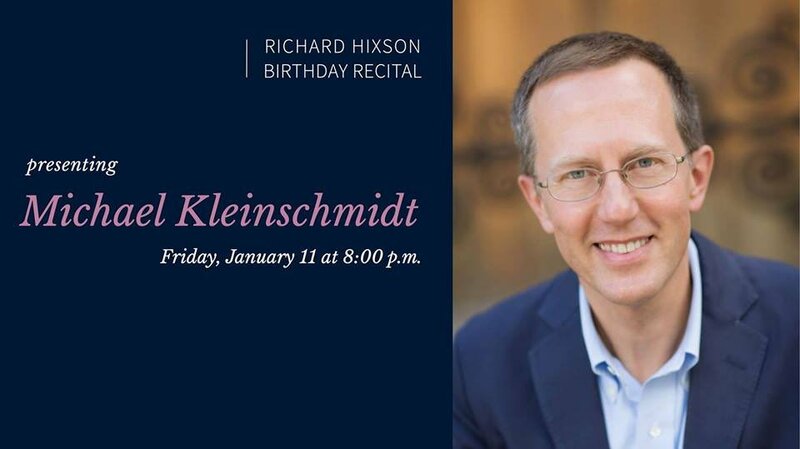 The Central Arkansas Chapter of the American Guild of Organists again hosts world-renowned organist Michael Kleinschmidt in a concert tonight. It will start at 8pm at Christ Episcopal Church. Michael Kleinschmidt is Canon Musician of St. Mark’s Episcopal Cathedral in Seattle. He previously served as Canon for Cathedral Music at Trinity Cathedral in Portland, Oregon. He holds degrees from Eastman School of Music and Oberlin College Conservatory of Music. Michael is an accomplished organist, having played in recital across the world, including an All-Bach concert on the Flentrop Organ at St. Mark’s in 2012. He also has a keen appreciation for the ministry of music in children, and serves on the faculty of the Royal School of Church Music summer courses.